The University of Birmingham is an English university in the city of Birmingham. Founded in 1900 as a successor to Mason Science College, and with origins dating back to the 1825 Birmingham Medical School, it was the first of the so-called Red Brick universities to receive its Royal Charter. 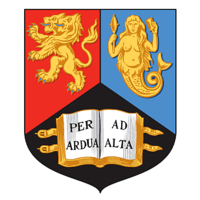 The university is a member of the Russell Group of research universities and a founding member of Universitas 21. It currently has over 18,000 undergraduate and over 11,000 postgraduate students. It is currently ranked as one of the top five British research institutions, and is ranked 11th overall in the UK, as well as 30th in Europe. It is one of three Universities in Birmingham; the other two being Aston University and Birmingham City University. The university's main campus, in the Edgbaston area of Birmingham, is arranged around the 100-metre-high (328 feet) Chamberlain clock tower (nicknamed "Old Joe") commemorating Joseph Chamberlain, the university's first Chancellor. The Great Hall of the university is in the domed Aston Webb Building, which is named after one of its architects (the other was Ingress Bell). The university's Selly Oak campus is a short distance to the south of the main campus. It was the home of a federation of nine higher education colleges, mainly focused on theology and education, which were integrated into the university for teaching purposes in 1999. Among these was Westhill College (later the University of Birmingham, Westhill) which merged with the university's School of Education in 2001. The UK daytime television show Doctors is filmed on this campus. The university also has buildings at several other sites in the city. The university's main campus occupies a site some 3 miles (4.8 km) south-west of Birmingham city centre. The original 25 acre site was given to the university in 1900 by Lord Calthorpe. The original buildings on the Edgbaston site were built at the turn of the 20th century. The original semi-circle of red-brick domed buildings form Chancellor's Court, at the centre of which stands the clock tower and which sit on a 30 ft (9.1 m) drop so the original architects placed their buildings on two tiers with a 16 ft (4.9 m) drop between them. The Joseph Chamberlain Memorial Clock Tower, affectionately known as "Old Joe", is dedicated to the university's first chancellor Joseph Chamberlain. The design of the clock tower draws its inspiration from the that of the Torre del Mangia, the medieval clock tower forming part of the Town Hall in Siena, Italy and is made from Accrington Red Brick. When it was built it was described as "the intellectual beacon of the Midlands" by the Birmingham Post. The clock tower was Birmingham's tallest building at 100 metres from the date of its construction in 1908 until 1969 and is still the third highest in the city. It is one of the top 50 tallest buildings (and the tallest clock tower) in the UK. The clocktower has four clock faces are each 17 ft 3 in (5.25 m) in diameter. The minute hands are 13 ft 6 in (4.1 m) long. At its widest part, the hour hand is 2 ft (61 cm) across. The hands are made out of sheet copper and the frame is made of one solid casting, weighing half a ton (450 kg). The pendulum is 15 ft (4.6 m) long. The largest of the four hour bells weighs 13,619 lbs (6,177 kg).The whole weight of the clock and bells exceeds 20 tons (18,150 kg). There is a long held superstition that if an undergraduate walks under the tower while it is chiming, they will fail their degree. The grand buildings were an outcome of the £50,000 given by steel magnate and philanthropist Andrew Carnegie to establish a "first class modern scientific college" on the model of Cornell University in the United States. The University of Sydney in Australia was also modelled on Cornell. Funding was also provided by Sir Charles Holcroft. On February 23, 1875, Sir Josiah Mason, the Birmingham industrialist and philanthropist, who made his fortune in making key rings, pens, pen nibs and electroplating, founded Mason Science College. It was this institution that would eventually form the nucleus of the University of Birmingham. In 1882, the Departments of Chemistry, Botany and Physiology were transferred to Mason Science College, soon followed by the Departments of Physics and Comparative Anatomy. The transfer of the Medical School to Mason Science College gave considerable impetus to the growing importance of that college and in 1896 a move to incorporate it as a university college was made. As the result of the Mason University College Act 1897 it became incorporated as Mason University College on January 1, 1898, with the Right Honourable Joseph Chamberlain MP becoming the President of its Court of Governors. It was largely due to Chamberlain's tireless enthusiasm that the university was granted a Royal Charter by Queen Victoria on March 24, 1900. The Calthorpe family offered twenty-five acres (10 hectares) of land on the Bournbrook side of their estate in July. The Court of Governors received the Birmingham University Act 1900, which put the Royal Charter into effect, on May 31. Birmingham was therefore arguably the first so-called red brick university, although several other universities claim this title, including the University of Manchester, since Manchester Victoria made significant developments towards the formation of a civic university proper in 1851, despite not gaining official status until 1903. 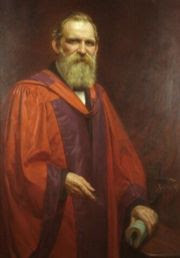 The transfer of Mason University College to the new University of Birmingham, with Chamberlain as its first Chancellor and Sir Oliver Lodge as the first Principal, was complete. All that remained of Josiah Mason's legacy was his Mermaid in the sinister chief of the university shield and of his college, the double-headed lion in the dexter. It became the first civic and campus university in England. The University Charter of 1900 also included provision for a Faculty of Commerce, as was appropriate for a university itself founded by industrialists and based in a city with enormous business wealth. Consequently, the faculty, the first of its kind in Britain, was founded by Sir William Ashley in 1901, who from 1902 until 1923 served as first Professor of Commerce and Dean of the Faculty. From 1905 to 1908, Edward Elgar held the position of Professor of Music at the university. Being a large university Birmingham has departments covering a wide range of subjects, which are arranged into eight subject areas, which are Arts, Languages, Literature and History; Business; Education; Engineering (comprising Departments of Mechanical, Chemical, Civil, Electronic, Electrical and Computer Engineering and Metallurgy & Materials); Law; Medicine, Dentistry and Health Sciences; Science; and Social Sciences, Government and Politics. The university is home to a number of well-known research centres and schools, including the Birmingham Business School, the oldest business school in England, the University of Birmingham Medical School, which produces more medical doctors than any other university in Britain, the Institute of Local Government Studies, the Centre of West African Studies, the European Research Institute and the Shakespeare Institute. Between 1964 and 2002, the University of Birmingham was also home to the Centre for Contemporary Cultural Studies, a leading research centre whose members' work came to be known as the Birmingham School of Cultural Studies. Despite being established by one of the key figures in the founding of Cultural Studies, Richard Hoggart, and being later directed by the renowned theorist Stuart Hall, the department was controversially closed down. The University ranked 26th out of 113 higher education institutions in The Times 2008 Good University Guide, and came 18th in The Guardian's 2008 rankings. It is ranked fifth nationally for Research Excellence. Birmingham is rated equal 92nd best university in the world in the Institute of Higher Education, Shanghai Jiao Tong University (IHE-SJTU) Academic Ranking of World Universities 2007. In October 2007, the University was also ranked equal 65th best in the world by The Times Higher Education Supplement. Due to Birmingham's role as a centre of light engineering, the university traditionally had a special focus on science, engineering and commerce, as well as coal mining. It now teaches a full range of academic subjects and has five-star rating for teaching and research in several departments; additionally, it is widely regarded as making a prominent contribution to cancer studies.